Lately my person has been having all the adventures and leaving me in dog jail. I guess she felt sorry for me because she decided to give me something to investigate. 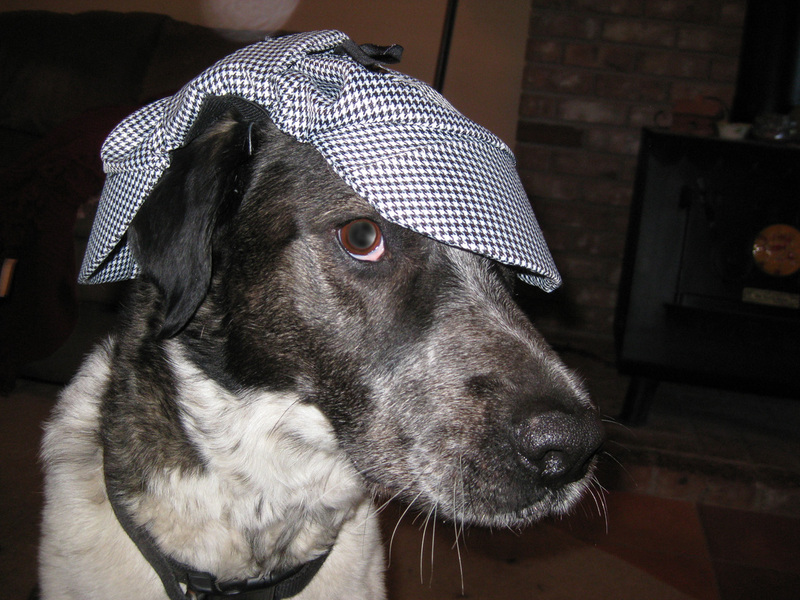 I didn’t bother to tell her that this investigation wasn’t even worth getting on my Detective Dog hat. As a matter of fact, it wasn’t much of an investigation at all. But it did allow me some great sniffs, so I’m not complaining. 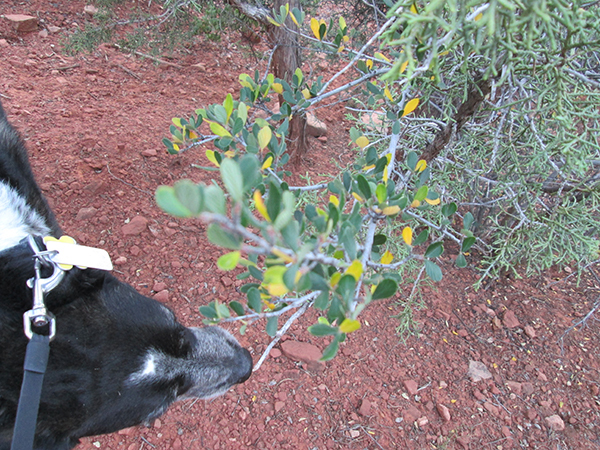 We saw that two toned bush in the first picture. I swear it was all green the last time we walked by here. But then we saw something even stranger. We saw bushes that seemed to glow on their own, almost as if they had lights inside them. 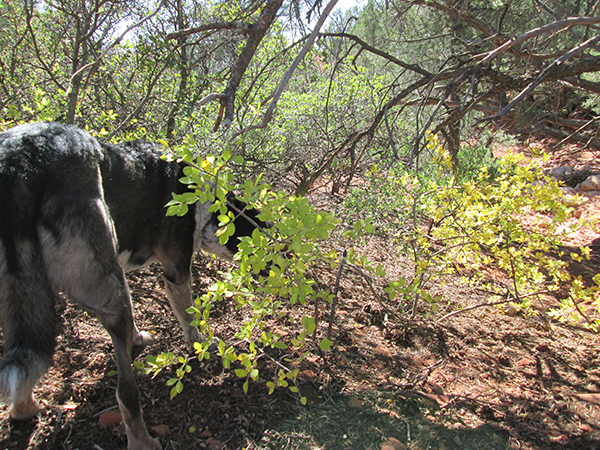 And after those bushes, we saw a tree doing the same thing. But I solved this mystery far too easily. There’s no electricity on my trails so it has to be something else. This is so obvious I don’t know why my person didn’t figure it out herself. If I dig right here it will be obvious to everyone. They buried the batteries right next to the tree. Patrecia, you mean there’s more to it? Patrecia, I loves you too. Lily, it was simply a matter of deduction. Ku, I don’t know. It doesn’t make sense to me at all. But my person says I drove her nuts during last thunder season and she can’t trust me home alone during a thunderstorm. We aren’t having any storms now. She could at least wait until we have one. How clever!!! I would never have thought of batteries!!!! Obviously! I was thinking about your new “house”… maybe it is better than having to be stuck in a dog hotel! Marina, at least as long as Scratchy doesn’t come gloating at me. For some reason he doesn’t have to be in a cage when my person leaves. Are those buried plant batteries causing the leaves to rattle and shake, too? Karen, those leaves do rattle and shake sometimes. I bet it is those batteries. It’s a good thing your person has you, B. you are brilliant! 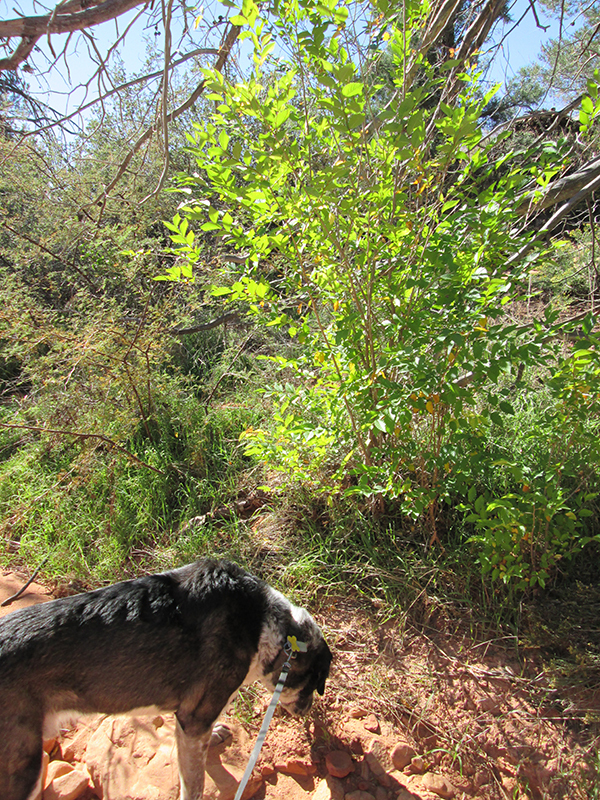 I wonder if a battery tree will grow there…..
Cupcake, maybe I should transplant that tree to our yard to find out. I bet that would save a lot of money having a battery tree. Wow! I never thought of batteries. You are so smart. Thanks Patricia. I do my best. Chancy and Mumsy, sometimes you just have to think outside of the tree. Hugs and nose kisses back to you. 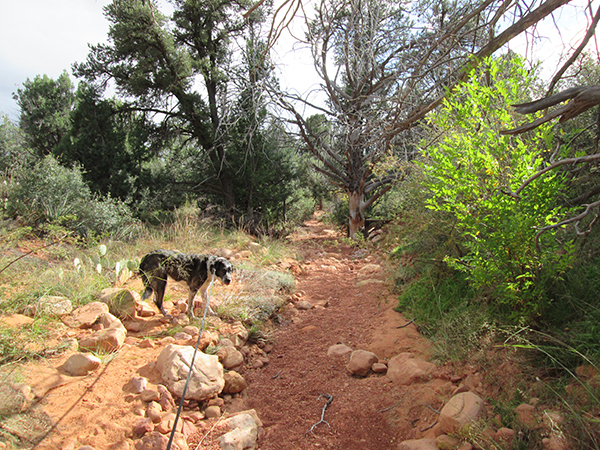 I’m afraid your person neglects walks on your trails recently because she has become envious of your formidable intellectual capacity. That’s it Kolytyi! My person is jealous of me. That’s why she keeps locking me in dog jail. I’m going to have to do something about that. Hmmm…..that’s very interesting…surely only the tree glows itself……you’re right Bongo, it has a battery under the ground……I wonder how long the battery would last? Kevin, maybe we should dig up the battery and find out how long it lasts. And then we can get a new one to replace it and dig it up again when it runs out. It’s a good thing your person has you around to figure things out Bongo. Who knows the crazy things she’d be thinking without your help? Diane and Lola, my person gets all kinds of crazy ideas. I’m always having to straighten her out. Collies, you would have figured it out too. The simplest things seem to confound people though.